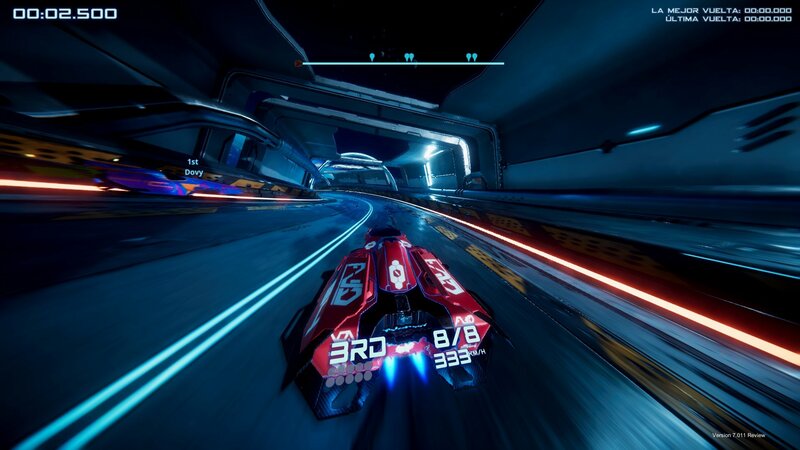 If yours are dizzying races, fly on the track on board of impossible vehicles while you gain momentum and knock down your rivals, Antigraviator analysis may encourage you to make the leap to the futuristic competition proposed by this extreme speed video game, which inevitably resembles the classic F-Zero and WipeOut. Thoroughly step on the accelerator regardless of anything or anyone. One hundred, two hundred … five hundred kilometers per hour !, and you continue accelerating, gaining speed to scratch those few seconds that separate you from your rivals in the frenetic futuristic races that Antigraviator proposes , a videogame that drinks from two greats of the genre such as F-Zero and Wipe Out, of course, but also looking for ways to stand out from the competition with their own particularities. The result is good, worthy of praise, although a discreet circuit design detracts from a production that could certainly have gone further thanks to the careful handling of the cars and, especially, the use of a series of trapsdesigned to obstruct the progress of the opponents, very much in line with what was seen in Split Second , although without the degree of spectacularity of the video game created by Black Rock almost a decade ago. It is great to plunge the race into complete chaos with a shower of missiles, to trap the opponents in magnetic fields, to burn them with the fire of a reactor, or to remove them from the track with a rockfall; but when you move at breakneck speeds, when even a blink can be an accident, it is not always easy to pay attention to the signals that warn of the traps, forcing you to react many times instinctively, which is not bad! there is nothing more exciting than performing a side sweep to escape in the last second of a deadly blaze, but it can also become frustrating when, suddenly, a laser barrier is planted before you or an explosive mine jumps that seconds ago did not even exist. This generates contradictory feelings. The idea is good and at times it is even exciting, because to see a rival fall in front of that bomb for which you seemed sadly predestined is priceless, little shake !, but it is missing some more strategy and above all, more spectacle That a rival explodes before you? 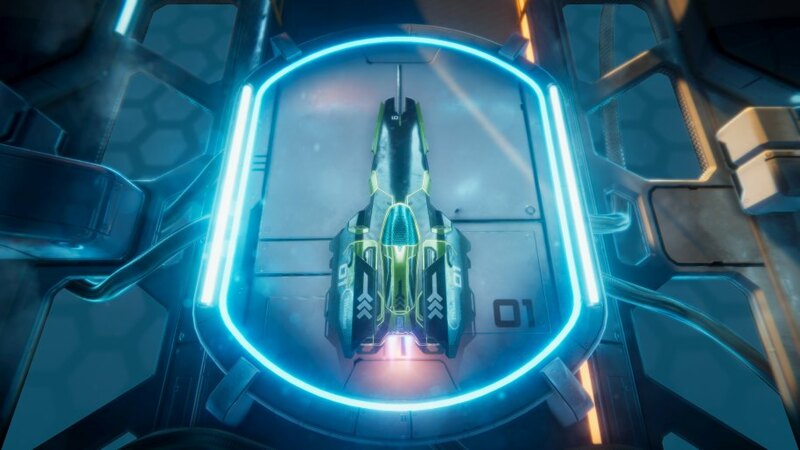 Rare will be the occasion when you can enjoy it because the traps are activated in the distance, in key points of the circuit, and you will only know if you have hit when the color of the energy shield of your racing car changes. Little thing against the idea of ​​hitting and crushing the rivals in close duels. Take momentum and do not stop! 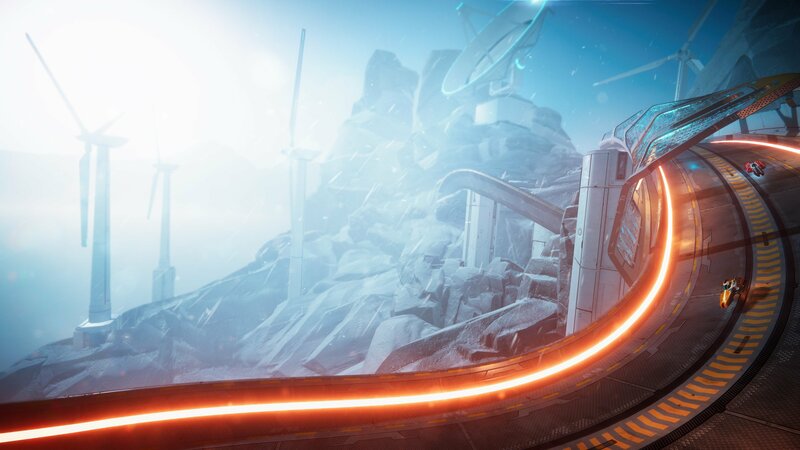 Without a speed limit, in Antigraviator you can run until you reach vertigo speeds without losing control of a vehicle that responds to the wonders at your command. The piloting is without doubt one of the strong points of a video game that forces us to slow down, to slow down, to take the most dangerous curves without scrubbing through the walls as in other titles of the style. It’s curious. Months ago the remarkable Redout I bet on the contrary, to punish the braking, leading us to slide the ships down the track with a succession of impossible skids that were pure spectacle. But this is the best; similar games that in turn feel different, with personality, although the work that we are dealing with today is not particularly novel. Yes funny, and challenging, especially when you face its multiplayer side that includes the option of split screen for four players, but lack of more creativity when designing circuits to live up to expectations. Antigraviator creates an imposing futuristic world capable of giving us spectacular picturesThe sensations at the controls of the cars could not be better, you really enjoy competing !, but soon you realize that the circuits are far from reaching the level of the largest . They are, as a rule, anodyne, simple in the sense that they do not have unique characteristics that make you remember or hate one or other clues. In general, you find the same type of routes, the same obstacles, the same curves or straight cross-country, but with a different environment. It’s not enough to make you vibrate with excitement with the thrilling races that this Cybernetic Walrus game proposes. Opposites will hit you, seek ways to hinder your progress, and you will accelerate, and run at full power accumulating more and more energy impulses while in your traced, you use the turbos and look for fuel tanks with which to continue increasing the march. If a rival gets heavy, and does not stop struggling, you can toss it aside using the sweeping motion. Beware that you can suffer that same attack! Do not go to think that the circuits are a complete disaster, they are not bad !, but it seems generic, which in the short term is the result of a video game betting on three different career styles , all of them framed in eight glasses with four tracks each. We have the standard competition, where you run to cross the first the finish line, but also the deadly races, in which the objective is the same but with the risk of being disqualified if we suffer an accident or are the last to go around the track – competitors are eliminated lap after lap-. It seems a trifle but it is a condition that creates a certain degree of tension that feels great to the race, as also the competitions against the clock, in which you must earn seconds through checkpoints. 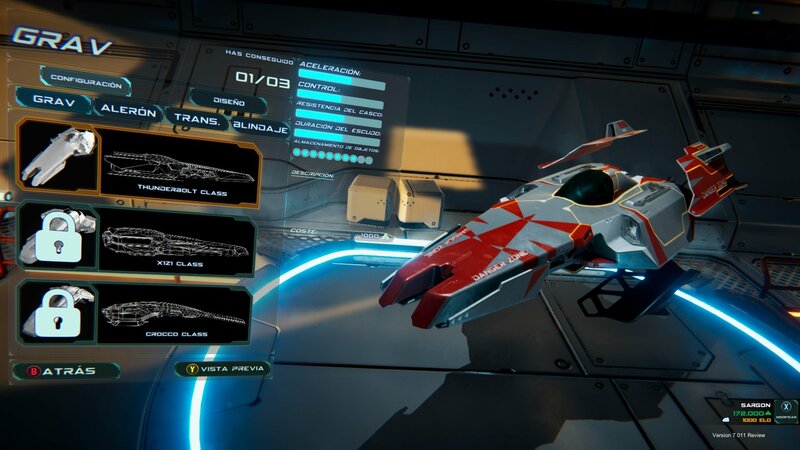 Small variations that give some color to a video game that also allows partially customize the performance of the vehicle by improving acceleration, resistance or control according to your preferences, so that the piloting is even more adapted to your own style. It is not an especially complex game but the truth is that this kind of details are appreciated. You can modify the design of your vehicle and change its features to boost speed or control. It is not very complex but the options are appreciated. 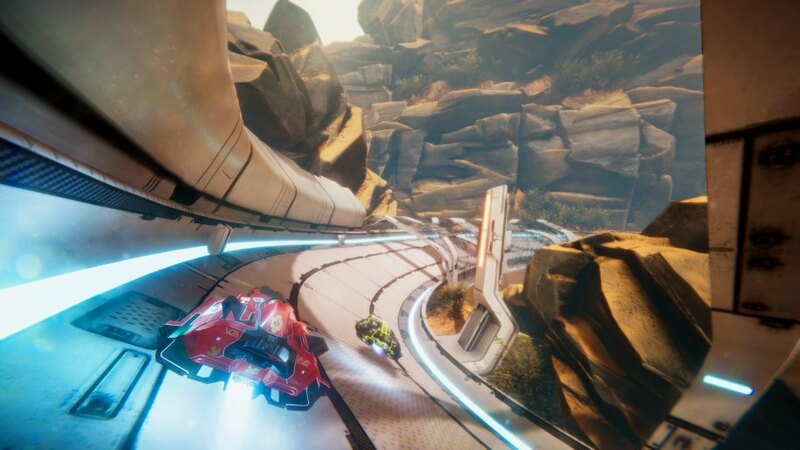 With a powerful multiplayer to challenge friends in exciting online duels, and a more than interesting piloting, Antigraviatoralso surprised by its powerful technical section . Its managers have opted for the Unity graphics engineto create an imposing futuristic world capable of giving us pictures of the most spectacular in which the design and modeling of the vehicles stands out, as well as the level of detail of the tracks on which we run. It lacks more personality and originality in the recreation of these environments but, certainly, this is a game that comes through the eyes. Also its sound section fulfills what was expected with a repertoire of songs cane that liven up the frantic careers of this video game F-Zero and WipeOut, although at this point I also miss something more personality. In general, it is the main problem of a title with good ideas but a discrete circuit design. His action is frenetic and at times also exciting, but not enough to rub shoulders with the greatest referents of the genre. If you are passionate about extreme speed videogames you will undoubtedly find in this Antigraviator more than enough reasons to enjoy its frenetic action. Cybernetic Walrus has managed to shape a fun racing title, with a certain personality, that challenges you with exciting duels in which it is essential to use turbo head and traps. The game does not fully exploit its potential and, as the main drawback, the design of its circuits feels simple, too generic, which detracts from its value.